Quickly acquire the knowledge and skills you need to confidently administer, score, and interpret the WAIS-IV. Providing a clinically rich and innovative theory-based interpretive system, this book offers state-of-the-art interpretation of the most popular intelligence test for adults. 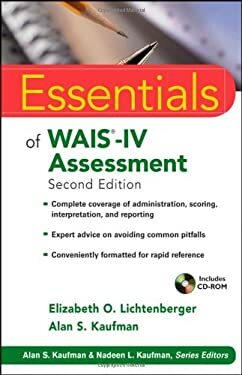 In addition, the book is packaged with a CD-ROM containing scoring tables, case report material, worksheets, and a user-friendly software program that fully automates the interpretive system, making "Essentials of WAIS-IV Assessment" the best and most authoritative resource of information on this test. ABOUT THE CD-ROMThe updated CD-ROM contains scoring tables, case report material, worksheets, and a user-friendly software program that fully automates the interpretive system.